I have been curious about sous vide. Antonio of Foodie-ah has been conducting all kinds of sous vide experiments on his luscious blog. But I did not know very much about this method of cooking, apart from the fact that it involves gently poaching vacuum-packed ingredients under precise temperatures and timing. This retains all the juices as no moisture is lost, and integrity of the food and flavours. Yes, but cooking food in a water bath did not sound very exciting to me. However, at Table 66 recently, my tastebuds have been enlightened. I'm impressed with how Chef Vincent Teng (formerly of The Dining Room and Scarlet Hotel) has combined sous vide with other techniques to create some amazing dishes. The fare is generally modern European, with a touch of Japanese. These are just some of the dishes on the new menu, which Chef Teng took six months to develop. Note that these are individual tasting portions - the actual dishes would be 3-4 times more than what is shown here. Confit of Tomato Momotaro (S$14) - basil infused tomato momotaro, mozzarella di buffalo, baby arugula, white sesame vinaigrette, smoked salt flakes. 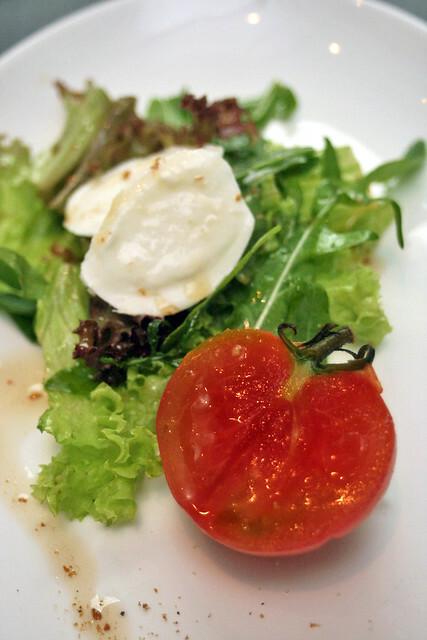 The juicy momotaro tomato has been infused with basil in its sous vide preparation and is such a treat. 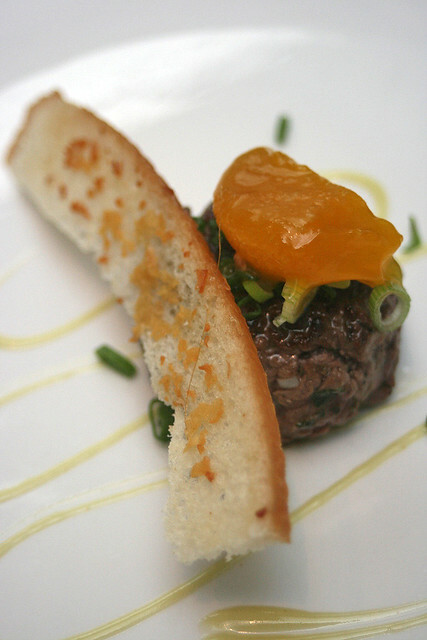 Seared Beef Tartare (S$18) - truffle miso infused creamy egg yolk, chopped spring onion, light wasabi mayo, crouton. Yes, I'm squeamish about raw meat, but thankfully this one is seared on the outside, so it's like a medium rare patty. However, the star is the truffle-infused egg yolk - cooked via sous vide to a creamy consistency. I savoured a small bite of it before mixing the rest with the meat. Petuna Ocean Trout (S$30) - poached warm ocean trout in citrus oil, seasonal grilled vegetables, sauteed spinach with pinenuts, chive sauce. Doesn't this looks gorgeous? It also looks like salmon, but this is trout. So very gently cooked but finished in the pan for crispy skin. So not everything sous vide tastes poached or boiled. 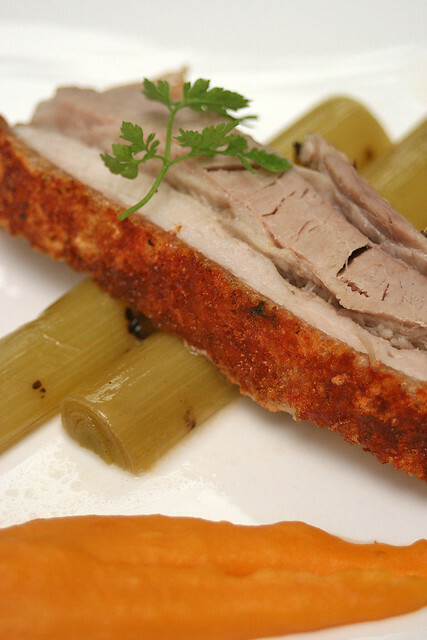 You can complete the dish with other methods for contrasting texture and flavours. 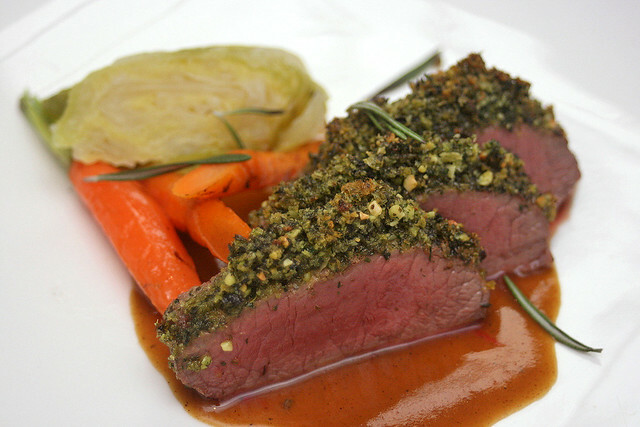 Lamb Loin (S$34) - Roasted herb crusted lamb loin, baby carrots, braised savoy cabbage, Japanese curry jus, sumac powder. The lamb is so sweet, moist and tender, thanks to sous vide cooking. It's finished in the oven for that delectable crust, and paired with a curry tinged jus that helped to lighten any gamey lamb flavours. Pork Belly (S$28) - sous vide osmanthus infused pork belly with crackling skin, sweet potato pomme puree, braised leeks and pineapple salsa. This calls to mind the Chinese roast pork "siew yoke" but the meat is unbelievably juicy and tender. The skin is finished again in the frying pan for that crackling effect. Roasted siew yoke could never be this moist. And now we come to dessert. These are full portions, and yes I ate them all! 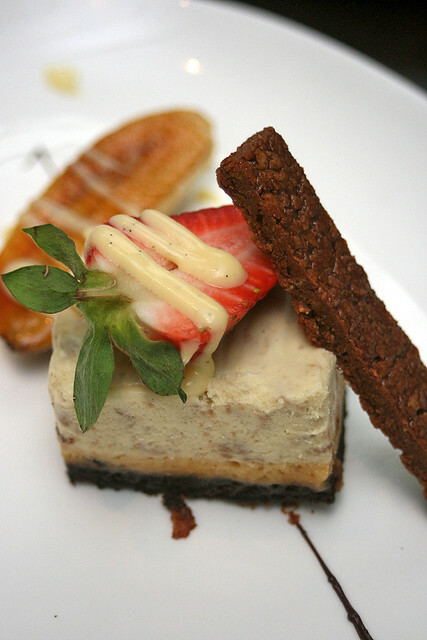 Peanut Butter & Banana Mousse Praline (S$12) - peanut butter and banana mousse cake, chocolate feuilletine crust, caramelized banana, crème anglaise. No sous vide in this but I loved every single component in this comfort dessert. It all goes so well together - peanut butter, banana, chocolate, cream. 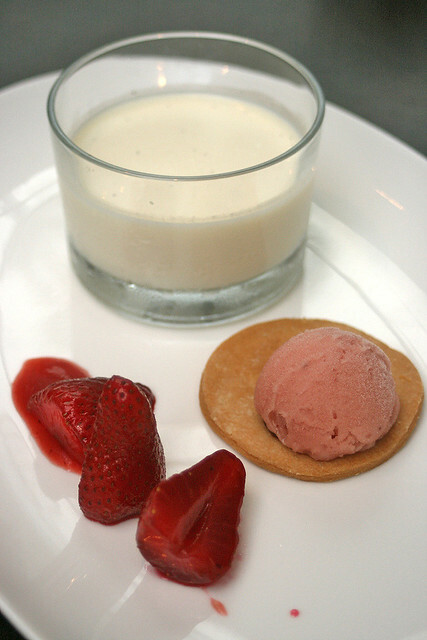 Lavender Panna Cotta (S$10) - lavender infused light cream custard, compressed strawberries compote with balsamic vinegar and sablée biscuit. The sous vide strawberries are extra intense! And again, all the different components go very well together. 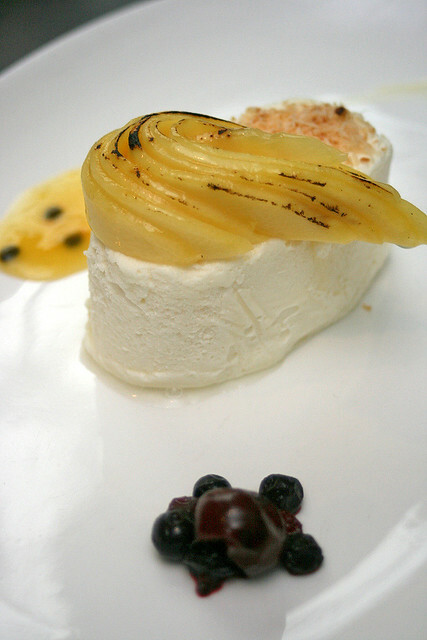 Coconut Parfait (S$10) - flambé mangoes, toasted dessicated coconut, cinnamon sugar and coated filo pastry. Coconut and mango - so very tropical! Other desserts include a warm chocolate and hazelnut cake fondant, and a cheese platter. Table 66 is casual, contemporary and chic. I love the skylight that bathes the dining area in natural light. There is something very comforting about enjoying your meal under sunlight. It's not a huge place - the dining area seats 30, and there is a private room for 10. 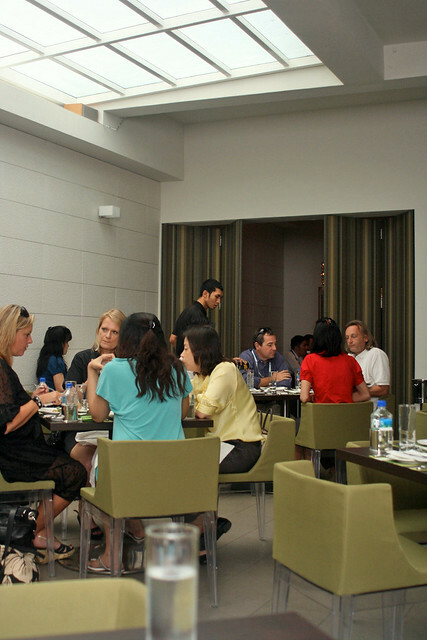 But even when the place is packed (as it tends to be at lunchtime), you'll still have enough privacy as the tables are set not too close together. The clear acrylic legs on the cushy chairs give a sense of space too. There are some very good set lunches at S$29 (note that not all mains may be sous vide dishes). I saw the portions that the other diners were having - pretty generous. The soft shell crab alone looks like a main! I'm certainly coming back one of these days for lunch myself! 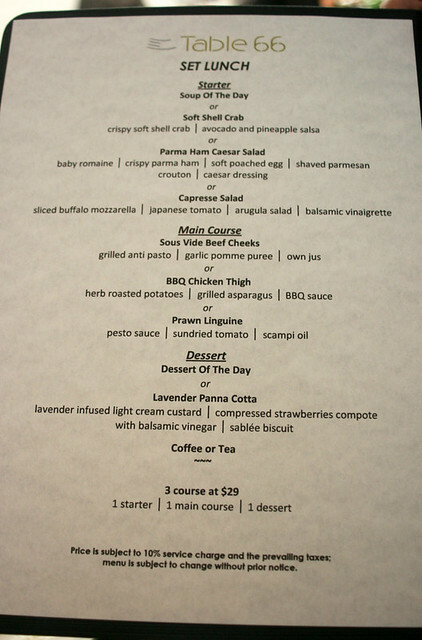 Set dinners are available at $66++ for 4 courses. The items available for set lunch and dinner change monthly. Oh, and corkage is waived on Mondays, if you prefer to BYO favourite bottle of wine. 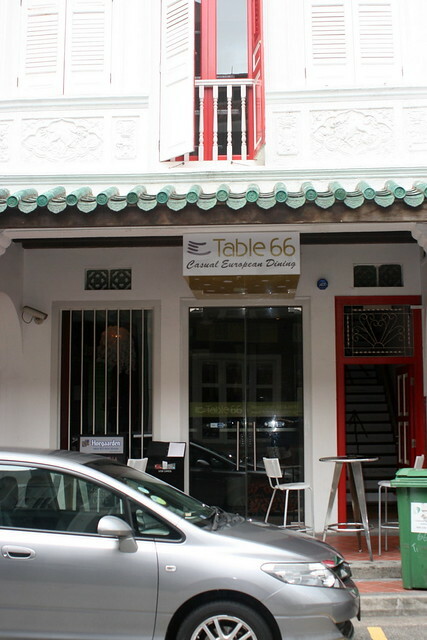 Table 66 is located at 66 Tras Street, in a refurbished double-storey shophouse. You should be able to find it near Tanjong Pagar MRT. Many thanks to Celine of Table 66 and Foodnews for the invitation to sample the new sous vide items and for hosting the lovely lunch. is this a tasting session? Sous Vide is also my fav cooking method. Retains most nutrients due to low temperature cooking. 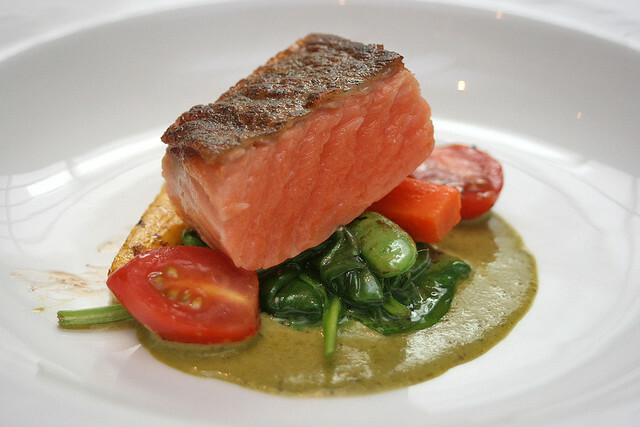 Best is salmon or ocean trout sous vide at 57 DegC. Simply melts in the mouth! Tchef: Yes, the trout was indeed melt-in-the-mouth. Looks good and reasonably priced, I will give it a try! Sous-vide is fun, but as you stated in your post it must be combined with other cooking techniques to result in truly appealing dishes.